If I can show you how to soar past your competition, become profitable faster and save yourself untold heartache and stress, would you say, “no”? 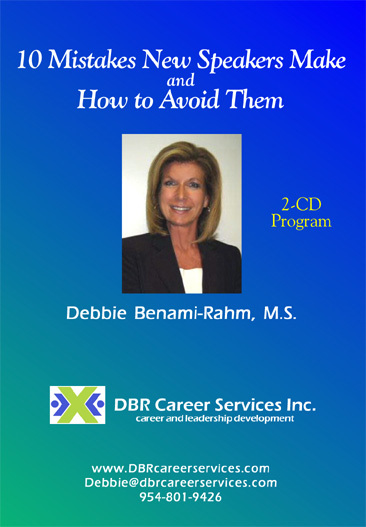 I’m Debbie Benami-Rahm, and three years ago, I had been downsized from the corporate world for the 6th time in 20 years. I wasn’t going to be downsized a 7th time. So, I started a speaking business – and as I look back on it now, I should have fired myself for making some of the mistakes I made! Yet I persevered, and my business became profitable. A word of warning: If you’re the kind of person who learns best by making mistakes, stop reading. Because this CD helps you avoid those costly, time-draining mistakes. · How to start a speaking business while working full-time? It’s the smart way to do it and I’ll tell you the steps to take. · How to start a speaking business on a shoestring budget? Let’s face it, start-up costs for any business can drain your savings fast! I’ll let you in on the essentials. · How to avoid losing lots of money. Would you like to learn how? Yes, as an entrepreneur building a speaking business, it is very easy to make some costly mistakes. I almost did. · How you can possibly do it all by yourself? To make things even more challenging, how can you do it on a limited budget? Have no fear, the answers are found on this CD. · How you can speak on a topic that you are not an expert on? · How to know when to say no or do you want to speak so badly that you are willing to speak on any topic. · How about when you should just let go and stop following up with a client before you become a pest? The difference between being successful and not being successful is in the “doing it” part. I made the leap from thinking about starting my speaking business to actually doing it. But, it did not happen overnight. In fact, it took quite some time. I share some of the key steps I took with you on this powerful CD recording of a live presentation I gave at the 2007 Speakers University for the South Florida Chapter of the National Speakers Association. Listen to my lessons learned and preventative actions you can take to avoid costly mistakes with your speaking business. P.S. If all of this sounds overwhelming, it’s because it really is. I break down some of the biggest fears of starting your own speaking business into small pieces with logical solutions from my very own brutally honest personal experiences. Let me help you get started on your speaking business.